Wish you all a very Happy New year 2016. 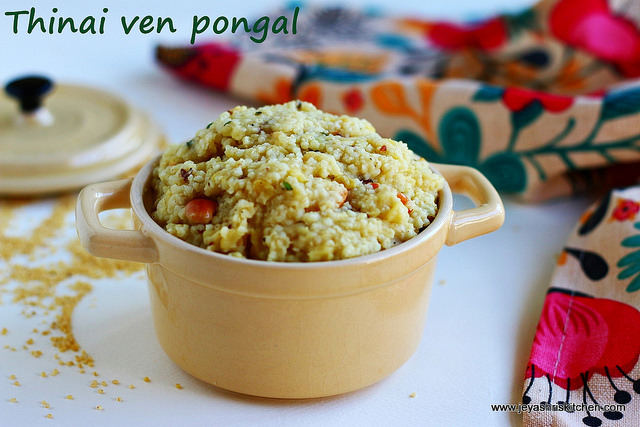 I wanted to start the New year with a healthy recipe and so made this Thinai Ven pongal today and posting the same. Pongal is a staple South Indian breakfast. During my very short vacation to Chennai last week, i got organic thinai | foxtail millet. Both my brother in law and his wife , left their IT job and doing organic farming in a small village near Pondicherry. This foxtail millet is grown in their field and i got it from them freshly after few days of harvest. But due to weight constraints i couldn't carry much here to Singapore. I have already posted the recipe of Ven pongal in the style which my mil makes it. But this Thinai ven pongal i have made it in my mom's style which is my most favorite too. Both my mom and mil are experts in making ven pongal. 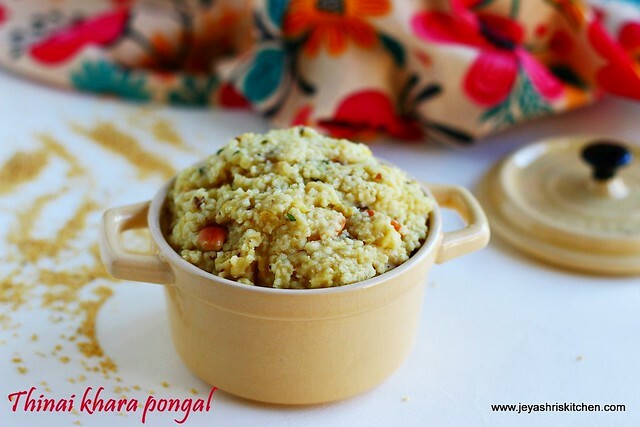 Try out this healthy Thinai ven pongal and start the day with a healthy breakfast. Check out my other Millet recipes and i have published a cook book on Millets in Tamil. Stay tuned for more interesting recipes coming up this year. Check out my Diet plan page too. Add thinai and moong dal in a vessel and wash it twice. Add it to the pressure cooker and add 2 cups of water to this. Add a pinch of turmeric powder to this. Pressure cook for 3-4 whistles. In a mixer add ginger, cumin, pepper curry leaves and pulse it coarsely. In a pan add ghee and oil and add the cashew nuts, after 5 seconds add the coarsely ground pepper jeera mix. Add salt to the pongal and add the cashew mixture. Mix well, if you feel it is thick add 1/4 cup of hot water to this. Khara pongal is ready to serve. Serve hot with coconut chutney or tiffin sambar. Thinai gets cooked so fast, but if you feel the moong dal is taking time, you can soak the thinai and dal mixture for 15 minutes and then can pressure cook it. 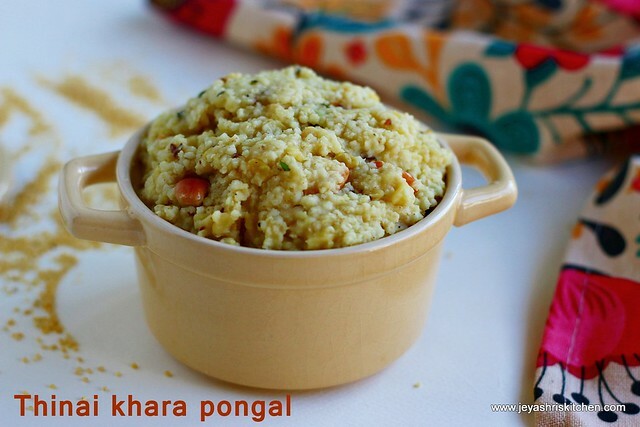 This pongal can be done using any millet like varagu, samai and kuduraivaali. You can add the whole pepper and jeera as it is without coarsely grinding it.